Each Thursday at 5:15 p.m. join Bill and Greg Burton for The Roth Report on ESPN Richmond. Two of Virginia's most entertaining sportscasters join forces each Thursday afternoon for The Roth Report on ESPN Richmond. The host of Hardly Workin' with Greg Burton, Greg is an award-winning sportscaster with more than 25 years of experience. Greg came to Richmond in August 1998 as a sports anchor/reporter for the local CBS affiliate, WTVR. During his tenure, he was named Virginia Sportscaster of the Year, Richmond Broadcaster of the Year and won a prestigious Edward R. Murrow Awardfor sports reporting. Prior to his career in Richmond, Burton worked as a sportscaster in Idaho Falls, Idaho and in his hometown of Wilmington, Del. He has also worked for the Wilmington Blue Rocks, a Class A minor league affiliate of the Kansas City Royals and the University of Delaware, his alma mater. Burton earned his master’s degree from the Center for Sports Leadership at VCU in 2012 and is also the Director of Communication & Engagement at the school’s Center for Sport Leadership. 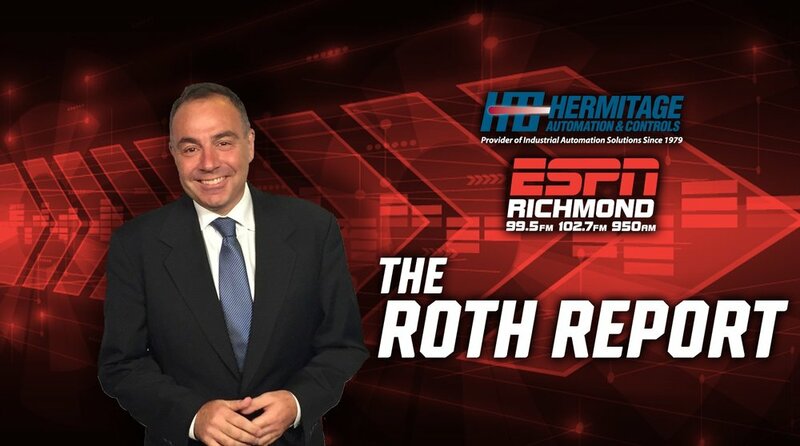 Bill and Greg will visit each Thursday afternoon on The Roth Report on ESPN Richmond, presented by Hermitage Automation and Controls. To listen live, click on the ESPN Richmond logo on this page. To subscribe to the Podcast version, click on the iTunes logo. To learn more about Hermitage Automation, please click on their logo. Bill with Hugh Hartness, owner of Hermitage Automation in Richmond, Virginia. Hermitage Automation offers a wide range of industrial automation products from over 100 recognized manufacturers. Our Sales Engineers and Product Specialist Engineers are here to support you in a variety of applications such as Motion Control, Sensor, Vision Inspection, Drives, PLC, Machine Safety, Pneumatic, Network, Ethernet, Mechanical, Linear and Robotic. Since 1979 we’ve served the food and beverage, packaging, material handling, tobacco, textile, power, semi-conductor and other such industries. You can count on our team to find the solution you need, and follow through with exceptional customer service. Please call us at 1-800-969-3030 to discuss your application. We want to be Your Distributor of Choice.